American tour. Feel like trucking to Tulsa? Booking to Boise? Motoring to Minneapolis? No problem… you pick the show, call us no less than 48 hours before the gig and you’re in! A limited number of 250 of these Black Tickets* will be available for $598 (yes… celebrating the re-issue of the Garage Days Re-Revisited EP!). All sale dates and times below. “Enough!” you say. “How do I get tickets?” Presales for Fan Club members begin tomorrow, February 27th. Visit https://metallica.com/metclub for all the details. Citi card members may purchase tickets beginning at 11:00 AM local time tomorrow, February 27th and Spotify will have pre-sale tickets starting on Wednesday February 28 th. 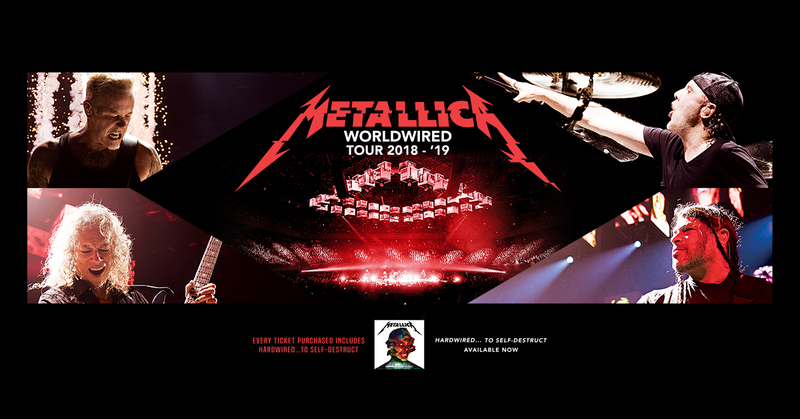 For a complete list of other presales, visit https://metallica.com . Public on-sale begins Friday, March 2nd at 10:00 AM local time.